iMetal proves its mettle in All Steels Trading’s meteoric growth. Since its formation in 2006 All Steels Trading Ltd has experienced spectacular growth from a standing start and now counts many of Europe’s leading steel distributors among its loyal customer base. All Steels Trading operates as a premier bulk steel trader with a dedicated portside facility, importing a wide range of both long and flat rolled products from some of the world’s best steel manufacturers. The business combines this service with an efficient and cost effective logistics operation that can offer an extensive product delivery within 48 hours from order. The company also provides a unique skill in being able to source and supply niche market products for customers throughout the world. All Steels Trading is no ordinary steel business – an award-winning specialist, All Steels Trading beat thousands of other companies to win the prestigious 2010 HSBC Business Thinking Award. Persuading a no-nonsense, lion’s den judging panel that exporting steel to Europe was a sound business practice, the company illustrated the business planning and thinking that makes All Steels Trading stand out from the competition. For the last two years the business has also featured high up the rankings of Yorkshire Business Insider’s Top 500 companies. It is therefore no surprise that with this clarity of vision from the outset that All Steels Trading is now one of this country’s leading steel traders, currently turning over £45 million per annum at a time when many of its competitors have not emerged unscathed from the economic downturn – this has to be testament to All Steels Trading’s acumen and professionalism. 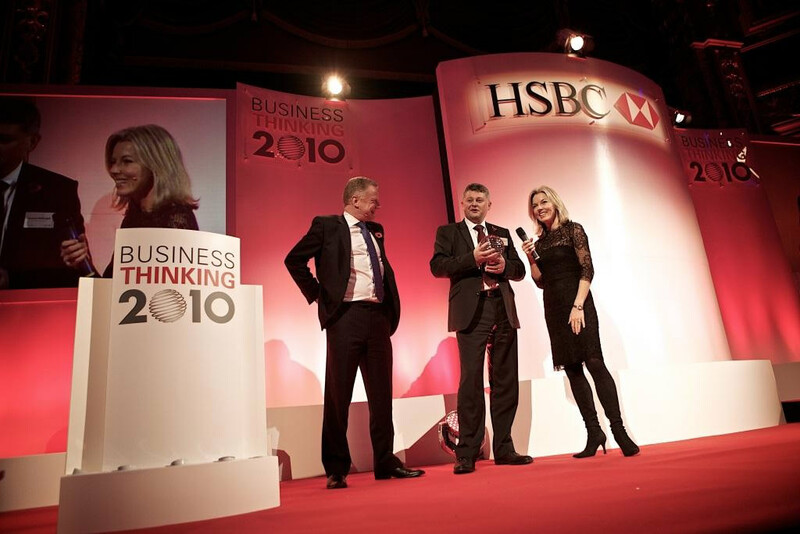 Laurence McDougall is presented with All Steels Trading’s HSBC Business Thinking 2010 winner’s trophy from ITN newsreader Mary Nightingale. The rapid rate of expansion experienced by All Steels Trading did however present its own challenges – particularly as the business continued to further expand its export business, dealing with multiple currency accounts across numerous time-zones so All Steels Trading needed an extra-ordinary partner to help it achieve its goal. All Steels Trading has enjoyed a good relationship with Metalogic since they were appointed as a preferred supplier from the company’s early days of trading. Metalogic’s Stockmaster System was recognised as being the most industrial standard system for many UK steel distribution businesses. This robust system served All Steels Trading well in the early days. However, as the business continued to grow in line with its vision to establish itself as a major international steel trading business, the company recognised that it would require a more comprehensive system, which would offer a wider range of flexibility than just order processing and stock management to cope with the growing demands of the business. With increasing man-hours being spent during the working day and beyond just keeping on top of its order handling systems, resulting in manual checks at the end of a long day, often working until the early hours, the time came to act. All Steels Trading began to explore the next generation of systems and after careful consideration of other operating systems on the market it was Metalogic’s iMetal that offered the necessary elements All Steels Trading required to allow it to grow – and more importantly a system that would develop with the business. However, it was the competitive edge that All Steels Trading was seeking and it was iMetal that presented some clear differentiating strengths. As well as being an effective order processing and stock management system iMetal is unique in allowing individual users to configure and adapt the appearance of search result information in their preferred style. Field boxes for example can be selected or deselected and arranged in an order to suit the user. The date table appearance of information can also be sorted or filtered in an order randomly selected by the user. The seamless interface with Jasper Report writer also allows users to build up a bank of queries for interrogating data that can generate reports in real time. Access to multiple relational database tables sitting within iMetal allow queries to run at lightning speed and the reporting tools in Jasper allow information to be clearly presented in documents that facilitate easy conversion to Excel spreadsheets, PDFs, Word documents and other formats. To have this clarity and efficiency of reporting at the touch of a button was something that would offer the distinct advantage that All Steels Trading was seeking over its competitors. Armed with this knowledge All Steels Trading took the decision to push the button on the iMetal system. Whilst recognising the initial trials involved in changing computer systems the company knew they could no longer continue to operate the restrictive and complicated manual processes. Working closely with Metalogic, All Steels Trading was able to clearly specify how it wanted the system to look and working to a strict defined set of rules was able to describe precisely how it required the system to perform. Initially running the two systems side by side All Steels Trading soon built up the sales history the business required. The confidence the new system has instilled within the organisation’s trading environment is unparalleled. Sales orders are always physically allocated to stock or specified forward purchases giving complete clarity on both the company’s unsold stock and forward positions along with transparency in the breakdown of materials, often into multiple ports. Database driven report writing can generate buying recommendation reports based on user defined parameters and drilled down analysis of both historical sales and live time stock. Another advantage is the automated generation of emails to customers detailing their outstanding order status on a daily basis or at a frequency to suit their needs. Teaming this with live reporting into the website every day, advertising stock and incoming stock for sale means that the company is constantly maximising its sales opportunities. 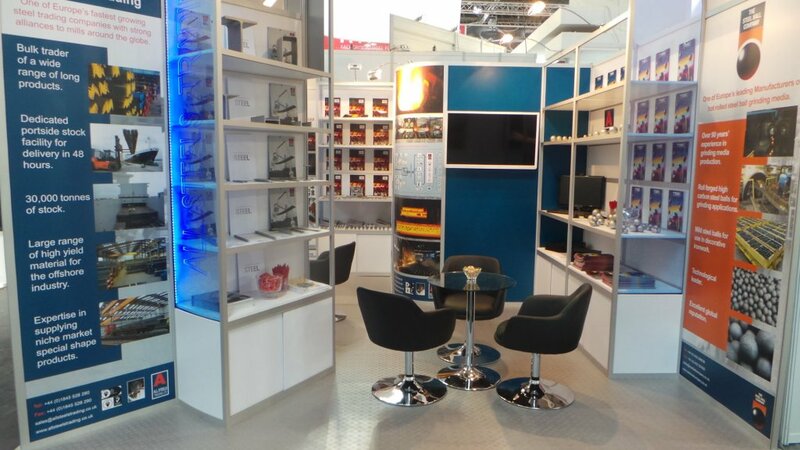 All Steels Trading’s exhibition stand at the International Tube and Wire 2014 fairground at Messe Düsseldorf. The facilities and features of iMetal have freed up what were huge administrative tasks and enabled us to concentrate our efforts on selling steel. iMetal has enabled our business to grow and given us the most professional presentation to the marketplace of any steel trading or stockholding business in the UK. Looking back we cannot imagine how we coped. As a trading platform iMetal has given us the assurance and competitiveness to take our business forward and as we move more and more into export markets, making increased use of multi-lingual documentation, following up everyday enquiries in different languages, tailoring them to ensure they are country relevant, along with professional documentation and imaging attachment we are confident that iMetal will grow with us. Couple this with the enthusiasm and passion of the development and support team we know this will continue to contribute to the professional advantage that differentiates us from our competitors. All Steels Trading has two sister manufacturing companies and it is acknowledged that iMetal’s features could also play an important role in both of these organisations. Legg Brothers, which is a hot re-roller of small steel sections and bespoke special steel profiles for a diverse international customer base would benefit from the CAD and other special drawing features, tolerances, product codes and attachment facilities. Likewise such benefits could also ideally suit unique sister company The Steel Ball Company, which manufactures grinding balls for the mining and energy industries. As All Steels Trading continues to expand further its trading horizons it is undoubtedly the implementation of iMetal that has made a significant contribution to the company’s ongoing success. Click here to learn more about this forward thinking company and to view their recent informative video.